The original section of the Fairbanks House in Dedham, Massachusetts was built in 1637 according to dendrochronology. The hearth was changed over the years and a brick oven built where "a hundred years ago [they] used to put a pot of beans on a Sunday morning" to return after church to baked beans. Incredibly, his descendants continued to live in the house until 1904 when the family founded an association to manage it as a museum. "The great chimney-stack stands in the centre of the house, where there were once huge fireplaces for burning superabundant wood. On one side of the kitchen fireplace an oven has been built, and on the other side a flue for a stove-pipe. Into that oven the dwellers a hundred years ago used to put a pot of beans on a Sunday morning, when the family went to public worship, with the assurance, from long experience, that they would be baked to a nicety on their return. 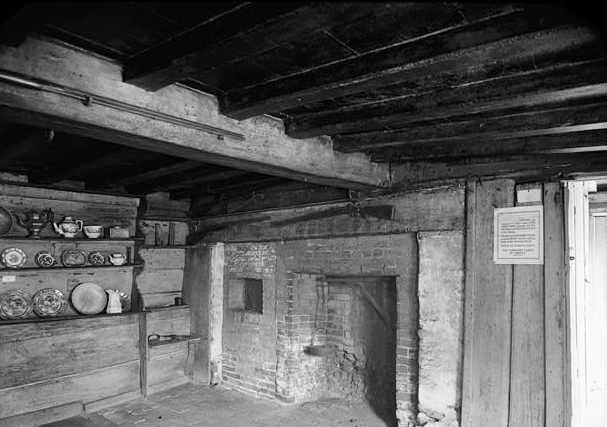 In that kitchen may be seen a huge beam, extending from the chimney across the room, and from this smaller beams, like ribs from a backbone, extend at right angles. The kitchen is dingy with the smoke of centuries of wood burning there. The ceiling is low. Much of the broad fireplace built at the beginning has been bricked up, and one of modern form and moderate size is now used. There may be seen ancient brass-mounted andirons, with shovels, tongs and bellows to match. In one corner of the room is a chest in which old crockery is carefully treasured. Hanging upon hooks in the great beam in the kitchen, the family gun, an old-fashioned flint-lock musket, with a barrel nearly five feet in length, and, with the stock, it stands six feet three inches in height. The stock extends nearly to the muzzle. It was owned by the original settler, who bequeathed it to his son Joshua."